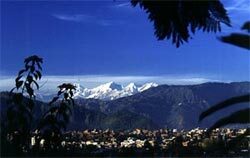 Nepal, also named as a Heaven on Earth is a wonder in the Himalaya. It is the Shangri-La, roof of the world, living cultural Museum, birth place of the Lord Buddha and is the country of living Goddess. Nepal offers an astonishing diversity of sightseeing attractions and adventure opportunities found nowhere else on earth. It is also known as a melting pot of Hinduism & Buddhism offering non-stop festivals throughout the year. Nowhere else on the world is found the astonishing diversity of sightseeing attractions and adventure opportunities as Nepal offers. Nepal is situated between China in the north and India in the South. The elevation of the country ranges from 60m above sea level to the highest point on earth, Mt. Everest at 8,848m, all within a distance of 150 kilometers resulting in climatic conditions from sub-tropical to arctic. The country is a potpourri of ethnic groups and sub-groups who speak over 70 languages and dialects. Adventure Silk Road with its carefully designed tour programs, lets the people to explore the highlights of the country. Come Join Us!